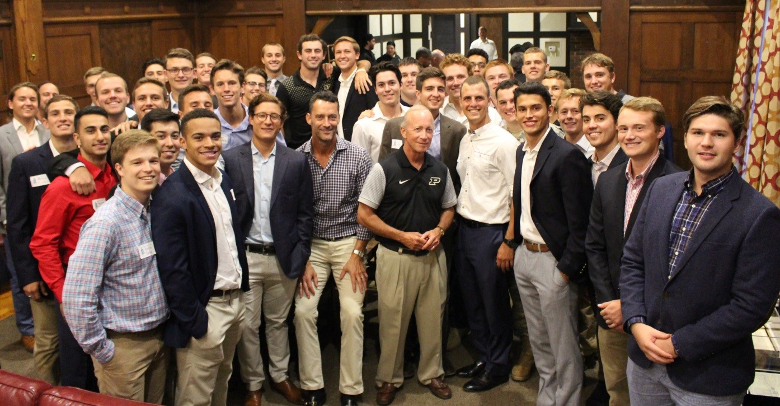 Purdue President Mitch Daniels (center) with Board of Trustees President Michael Berghoff to his right, poses for a photo with the Sigs attending the YPO event at Delta Delta. 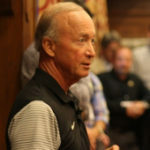 With Purdue President Mitch Daniels and Board of Trustees Chairmen Michael Berghoff in attendance, you knew it was a big deal. That’s why Delta Delta was so honored to host 50 members of the Young Presidents Organization (YPO) for a casual dinner and remarks by President Daniels. 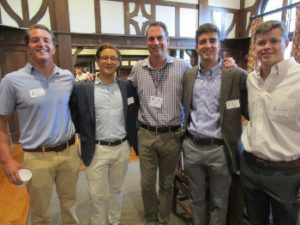 As part of the YPO Indiana Chapter’s annual conference, held on August 24 – 25 at Purdue, the university arranged to hold its dinner Thursday evening at the Sigma Chi house. The idea of holding the dinner at the Sig house was initiated by Keith Krach through his connections with the Board of Trustees. Michael Berghoff, who serves as chairmen of Purdue’s Board of Trustees, was the host for the evening. Flanked by Sigs (L-R) Joe Shaugnessy, Hernan Martinez, Sam Rudder and John Reid, St. Elmo’s President Craig Huse (center) enjoys his visit. With Butch Brose’s able guidance and the hard work of the active brothers, the chapter house looked great. The new curtains arrived just in time and with new carpeting in the Great Hall, we were set. Purdue took care of the meal and setting up the Great Hall for a casual cocktail hour and the dinner to follow. There were two highlights for the evening. The first was having President Daniels speak and answer the insightful questions from the audience. The second was having a large number of the brothers take part as hosts for this gathering. With over 40 brothers mingling with the group, they had a great opportunity to talk with some of Indiana’s young business leaders. The guests also had fun learning more about fraternity life from the brothers. Seth Morales (checked shirt) President of the Morales Group and remembered for his winning catch from Drew Brees in the Ohio State game, is joined by Sigs (L-R) Jack Healy, Drew Greene, Mitch Brown, Brady Flemming and Bryce Cirbo. Michael Berghoff thanked the active chapter and the Delta Delta House Corporation for being such gracious hosts. Bob Andreone, Mike Andreone and Phil Steele were in attendance as representatives for the House Corporation.